Black and white team photo, 15 named players in kit. 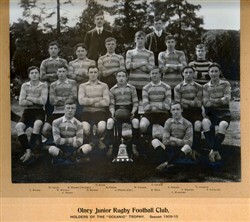 Back row: W. Adams, B. Minard (vice captain), R. Peters, W. Crouch, P. Holmes, T. Andrews. Middle row: T. Wilson, W. Whiting, N. Hatton, A. Huckle (captain), H. Horn, T. Whiting, F. Longland. Front row: C .Harris, F. Millward. Two other men (E. Adams, F. Church) stand behind the players. All are posing behind a trophy. Photo by Greenway, Northampton. P.H.Greenway, 27 Abington St, Northampton.